I have been in love with the Dutch band After Forever for a long time. Probably, ever since I shelled out $35 for the Japanese version of the 2000 first full-length Prison of Desire. The combination of angelic female soprano, symphonic progressive metal, gothic rock and death metal parts was strangely coherent and had few peers it could be compared to. As much as Floor Jansen shined on that album she was even more impressive on the follow-up Decipher. Talented but girlish vocals were replaced by a mature womanly soprano. The band became even more symphonic, used a large number of non-traditional instruments, and Floor’s duet with a male opera tenor was beyond belief. Understandably, when I got the news that guitarist/vocalist Mark Jansen was leaving the band to concentrate on his other outfit Epica I became concerned. Will After Forever make it? With trembling fingers I have inserted 2004 Invisible Circles only to be relieved. 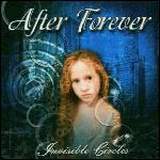 After Forever is back in full force, and it is here to stay. I may be unpopular by saying this, but the Beauty and the Beast concept originally introduced by Theatre of Tragedy, and developed further by the likes of Tristania, The Sins of Thy Beloved and Sirenia, can carry me only so far. I own all albums by the aforementioned bands, but After Forever is so much more. While the Beauty of Floor Jansen outshines anything those Norwegian female singers had ever done, the backdrop of After Forever music is much more complex and multi-faceted. Many struggle trying to exactly name the genre After Forever would represent, but very few can walk unaffected by their albums. In fact, I have a female friend who swore by old Theatre of Tragedy, and when she heard My Pledge of Allegiance I from Decipher she was stunned. It may be a very personal impression (after all it is my personal review), but on Invisible Circles the band wanted to delve deeper in their heavier progressive metal roots. The whole album, including the production, or maybe driven by it, feels edgier and packs more punch than Prison of Desire and Decipher. Maybe that is why it takes a while to get into, while Decipher jumped on me from the very first listen. Invisible Circles does not have long section where instruments carry the melody, most melodies are vocal where Floor Jansen simply shines. Her soprano defies and challenges the heaviness of the riffs (Beautiful Emptiness), overcomes the quirky progressive rhythm structure (Blind Pain) or soars against the dramatic surroundings (Reflections). The moments when she exhales from the top of her lungs (choruses on Beautiful Emptiness and Life’s Vortex) are stunning, you simply can’t help but be in awe. The band continues to be very symphonic, yet their concerto this time around is dark and ominous. You can almost feel it from the intro sounds of Childhood in Minor where kids’ voices on the playground are slowly subdued by the overpowering synth. The blend of symphonic, heavy and progressive is perfect. Everything meshes well and no sections feel like oil and water. The Swanlake ballet intro of Digital Deceit is hijacked and slammed against the guitars’ heavy barrage, and violin (tender) – guitar (savage) point-counterpoint is mesmerizing. After Forever continues to use string instruments heavily, and they fit in so well, even the sitar on Through Square Eyes with its Middle Eastern feel. The violin can even do a quick solo as in Blind Pain contrasting the spacey keyboards. Most of the songs, probably because of their symphonic nature, are complex and unpredictable, but a quicker pace more free flowing power metal cuts like Victim Of Choices do exist. Enough about the Beauty, I think you get the picture. The Beast part of After Forever is NOT only the male grunts by Sander Gommans, it is progressive nature of their death metal parts almost bordering on Swano’s Crimson II. While definitely not as aggressive, it is very convincing, demonic at times (Blind Pain), and counterbalances the Beauty completely. I liked Sander’s death grunts, but it is obvious he feels much more comfortable with that style of singing than with the clean vocals which also make an appearance on the album. Better clean vocals are almost a necessity for After Forever music. An idea to use a male opera tenor for Imperfect Tenses on Decipher still reigns supreme in my book. His clean vocals were a perfect complement to Floor, while Sander does not stand a chance. That is why probably Floor sings alone on the piano ballad Eccentric, and without a male counterweight it does last a minute too long. Another element the band has done away with is the choirs. A few do exist (the cathedral variety in Life’s Vortex) and they sound stunning, but I wish there were more. Well, maybe the band didn’t feel this way as the whole album is a concept based on the individual child story, and the choirs are less appropriate. I intentionally did not say at the beginning that the album is a 12-track concept, and a risky one at that. It tells a story about how the world is seen through the eyes of a girl, with her father’s violent rages, cyberworld deceiving strangers, etc. The album even has two quite lengthy dialogues, one hopeful, another dashing the hope completely. Father and mother hoping to unite while bringing a baby into this world are eventually torn apart, call each other names and slam a door in the face of the family and future, with their little girl overhearing it. Isn’t this what goes on in many families today? As a father of a 4-yr old girl, the concept got to me personally. It forced me to step back and think whether I am pushing my child too hard. Remarkably, the band is quite young, under 25 years old on average, but both the concept and their music seem so mature. While definitely not an easy listen, the album is a grower and will be in my Best of the Year, even though I am not giving it >90 today. I know that I will come back to it many a times this year, something I can’t say about other “quick hit and fade away” albums.